Fusion Goes Around the Pretend Moon. 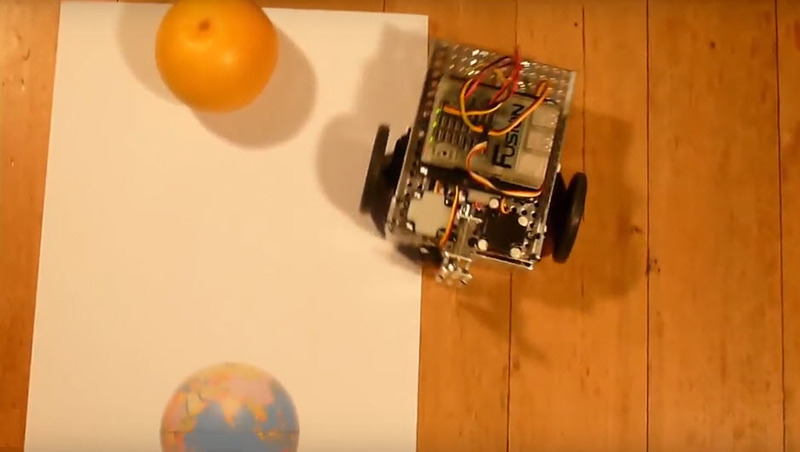 This is a Challenge where we teach our Fusion Robot to leave a pretend “Earth”, go around a pretend “Moon”, and attempt to land cleanly back right on top of our pretend “Earth”. We start this tutorial by developing a Blockly solution to this Challenge. We then convert the Blockly program into Python Code, and demonstrate pruning the automatically-produced Python equivalent of the Blockly program from 51 down to a more efficient 27 lines, to make a Challenge solution that would impose less computational load on an inexpensive computer chip. Note: We have tried to record these videos with recently charged batteries in our Fusion Robots. If the battery in your robot is low in charge, the distance traveled by your robot can vary from the examples shown in our videos. Downloadable Arenas: If you have access to an A3 printer, an arena that we have used for this tutorial is available for download, (Web). If you have access to an A1 printer, you could also re-use an arena that we have already used in the “Alien” tutorial (Web).